This revitalized new edition of Strategic Operations Management focuses on the four core themes of operations strategy, a vital topic for any company's objectives: strategy, innovation, services, and supply. Expertly authored by a team of Europe's top scholars in the field, the text is enhanced by the addition of new case examples, graphic images, learning objectives, discussion questions, and suggestions for further reading. In addition, the companion website offers a comprehensive set of web links and videos to augment the learning experience. This truly comprehensive volume underscores the differences between the core theories that underpin operations management. 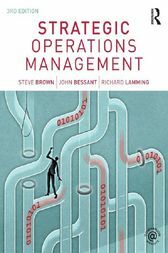 Students taking MBA, MSc and MBM classes on operations management, advanced operations management, and strategic operations management will find this textbook fulfills all their requirements whilst advanced undergraduate classes in these areas will also find the book an essential read.